When he began his academic career at Yeshiva University’s Yeshiva College, Joey Small (‘05YC ‘09BR ‘13A) knew he was in the right place to further the values he’d grown up with in Los Angeles, California—a life dedicated to Jewish living and learning, deeply rooted in both spiritual and worldly knowledge and a commitment to the State of Israel. What Small didn’t realize at the time was that one day, he’d be taking those YU values back to California as the University’s West Coast Regional Director. After graduation, an opportunity to become a teacher and student activities coordinator at Small’s high school alma mater, YULA High School, changed his career plans from medicine to Jewish education. He returned to YU to launch a new teacher fellowship program at its newly-formed Institute for University School Partnership, earning his master’s degrees in the process from both the Bernard Revel Graduate School of Jewish Studies and the Azrieli Graduate School of Jewish Education and Administration. 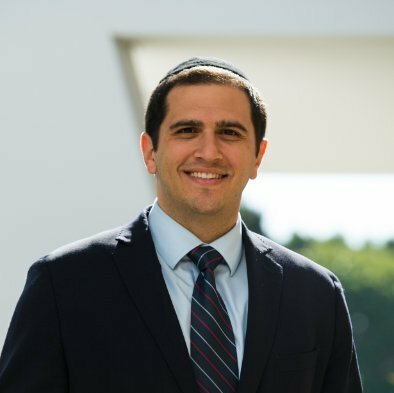 “I loved my time working at the YU School Partnership and developed close relationships with many yeshiva and day school teachers and administrators from across the country,” said Small. At the same time, he and his wife, Dana, served on the educational staff of the Manhattan Jewish Experience. In 2011, Small also became an associate professor at the City College of New York, teaching a course on Jewish mysticism —the topic he had focused on in his studies at Revel. In 2012, the Smalls headed west again as Joey became the director of institutional advancement at YULA’ Boys High School, overseeing the school’s development, admissions, marketing and alumni efforts—and earning his MBA at the University of Southern California’s Marshall School of Business. Now, Small is back at YU as its Western Region Director, leading the University’s development efforts on the West Coast, helping a variety of University departments coordinate their efforts with schools and shuls in the area. He will also work to make sure alumni stay connected and that the Greater L.A. Jewish Community is aware of YU and its important place in the American Jewish Community.